A chef friend of mine once told me that I’m missing out on a great thing if I never eat brussels sprouts. He also said that there are so many ways to make them delicious! Since I consider myself an adventurous chef myself I decided that I would create some interesting recipes with them. 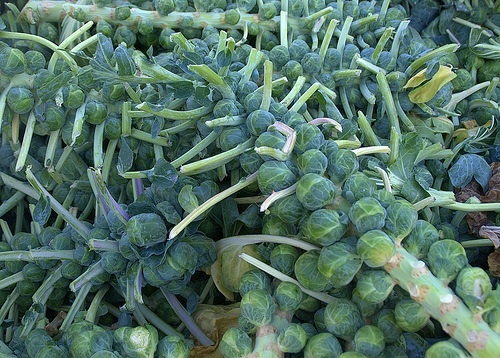 Brussels sprouts is a vegetable consisting of the small compact bud of a variety of cabbage. Brussels sprouts are a beautiful vegetable to grow in your garden. It consists of a stalk with many little sprouts that look like tiny cabbages. Brussels sprouts have never been very popular around our house, I guess because neither my husband nor I grew up eating them. I recently ate at a great restaurant in Birmingham Michigan, Cafe Via, and my friend ordered them. They looked really good and I tried them and they were delicious!! This is my attempt to recreate that recipe. Now to find some additional recipes for brussels sprouts. 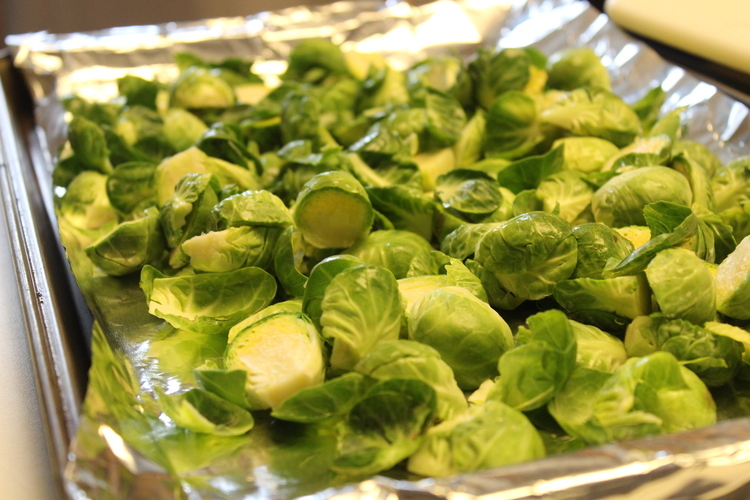 WASH AND CUT UP BRUSSELS SPROUTS AND PLACE ON ALUMINUM FOIL IN BAKING PAN. 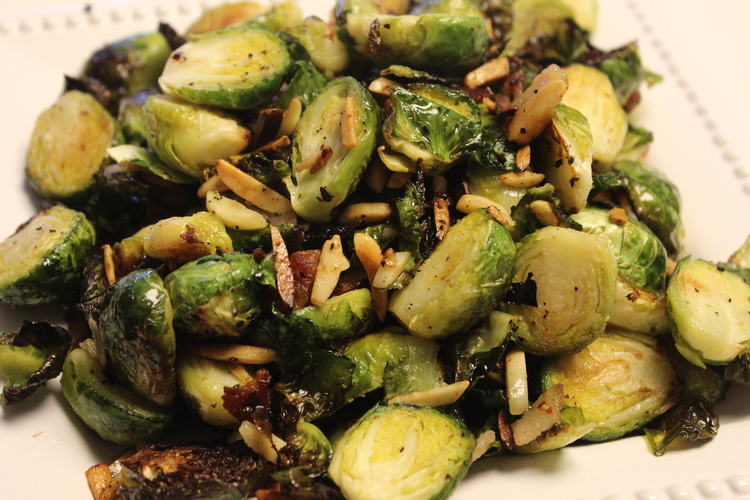 BRUSSELS SPROUTS WITH BACON, ALMONDS, DRIED CRANBERRIES, OLIVE OIL, SALT AND PEPPER. This recipe uses way too much fat. I’d use half the bacon and half the olive oil. I agree Carolyn. Make it to your tastes. I agree, just use the amount that suits your tastes. I would add less olive oil and less bacon than the recipe originally listed. 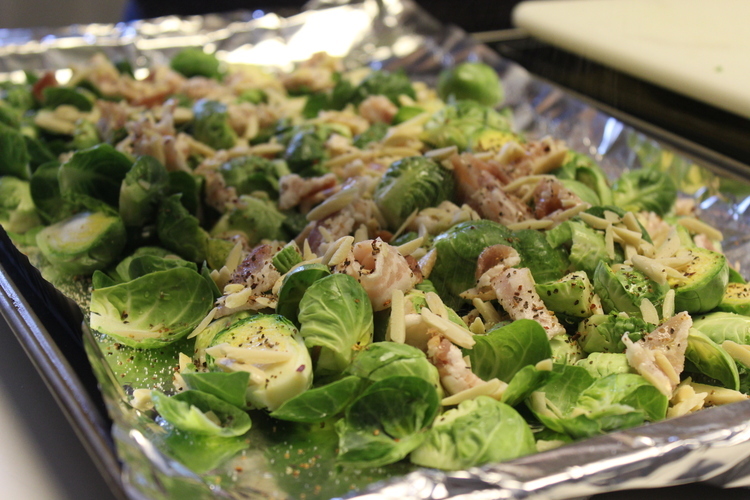 You could cook the bacon ahead of time and drain and then add to the brussel sprouts at the end. I agree. I would also suggest putting ingredients into a bowl to toss, as it seems impossible to toss a sheet covered in tin foil. It would be helpful if you would post a print icon for the recipes! This recipe is an old recipe before print buttons were added to the website. The newer recipes do have print option. was the bacon added raw or fried and crumbled? You could add them raw and then roast with the brussel sprouts or add them later already cooked to reduce the amount of oil. Fried and crumbled would work but in this recipe I added it raw and then roasted the brussel sprouts in with the bacon.